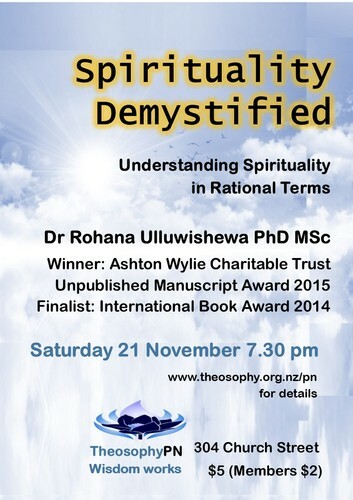 Spirituality Demystified - Understanding Spirituality in Rational Terms, presentation by Dr Rohana Ulluwishewa PhD MSc, who has also written a book entitled Spirituality Demystified: Understanding Spirituality in Rational Terms, which has won the Ashton Wylie Charitable Trust Unpublished Manuscript Award 2015 for this book and is now being published. Dr Ulluwishewa was honoured as a finalist in the International Book Award 2014 for his previous book Spirituality and Sustainable Development. Rohana Ulluwishewa was an Associate Professor at the Sri Jayewardenepura University in Sri Lanka. After gaining a M.Sc. from the London School of Economics and Political Science, University of London, he completed his PhD at Kyushu University, Japan. In his thirty years of academic career he has worked as Senior Lecturer at the University of Brunei Darussalam, and was Visiting Fellow at Wageningen Agricultural University and Leiden University in the Netherlands, and at Leeds University, UK. He served as a consultant for many national and international development agencies and has published in numerous international journals. He was also an Honorary Research Associate at Massey University in New Zealand, where he currently lives.